Just a peek at the new and remodeled garden walls. The falling down fence on one side is gone, and the extra wall is gone too. Then, a new wall was built to replace the falling down chain link fence on one side of the yard. And finally, the three different walls were stuccoed to match. This is a peek of one that has dried. We love it, because it's a color that takes on whatever is next to it. 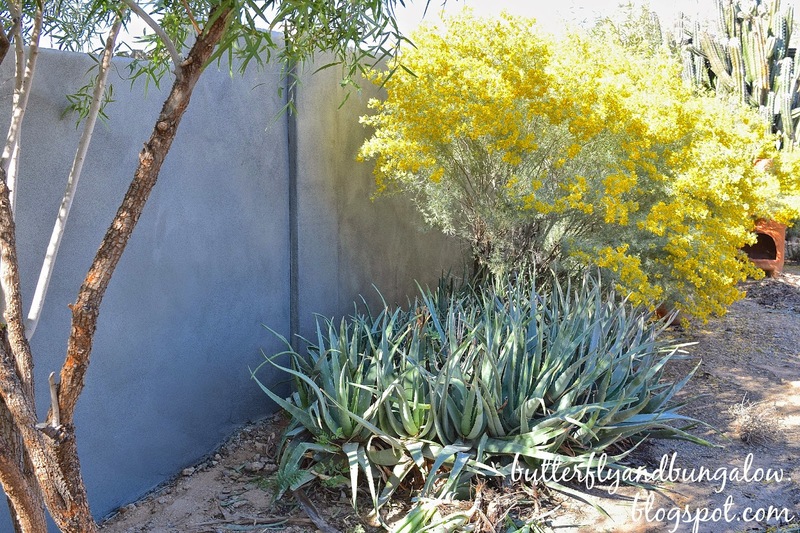 This one looks a little lavender blue, spots of walls that have more sun look aloe or gray depending on the time of day. They also now cast pretty shadows. I will share a few more photos and some befores soon. I've always wanted a walled garden. Up here it would extend the growing year and possibilities because of the micro climate created inside. Yours is a beautiful colour. That is so interesting. Is that why there are so many walled gardens in England? Here is about the only option, besides metal. Metal can be done on the front very artfully, but a wall in the back is about the only thing that will last, because wood or vinyl can't take the sun here. Thank you, Little Treasures. I agree. Fabulous! What a wall!!! I never felt happier than I did when I added my privacy fence last summer. Enjoy! Thank you, Anne. I agree on the privacy. The backyard was partially open to the street, an alley, and one neighbor, so now it's enclosed, and much more private. Looks great. I love when a garden is like a room with hedges or walls around. Then you can use it like a room in a house and furnish it with plants! Thank you, Elisabeth. I hope to, some day. Thank you, I think in this case, our yard is the one a little worse for wear. I hope to remedy that soon. One side of the yard is nice and established, but the other side was uncared for when we move here. We finally moved all the junk out. Very nice. I love a walled garden. It's so nice to see green. Pretty. I din't know your home was lavender! It's a desert color, because it shows up in the cactus. The wall is a sort of gray that looks lavender or another shade depending on the light. Love the walls in your garden! I've always loved walled gardens, reminds me of England. Thank you, Judith. It has been a bit warm for a few days, and I noticed I have tomatoes the size of marbles now! I do love stuccoed walls. Bright colors pop so beautifully against them. Yet, gray and green also show well. Living in Texas I find stucco to be very comforting as it is used frequently in the Hill Country and many historical building. When I lived in Louisiana there were also many stuccoed houses with big trees and hanging moss. Warms my heart to look at stucco. The new wall look fabulous! I prefer garden walls over fences and your paint is magnificent with all its nuances. Lovely color, brilliant choice. Looking good! What is the pretty yellow shrub? Spring is definitely in the air! What a pretty garden. Beautiful ! Oh please hurry up spring. This is so great. Love how it sets all the plants off. Very pretty. Walled gardens are my heart's desire, at least in the garden realm. So happy for you! Exactly what I would do, and the texture and colour adds a desert French feel to a wahed wall that almost looks acid washed so as to pick up different tones in the succo. Amazing what block and succo colour coat can add to a garden privacy wall. I know you will love how much beauty it lends to the back drop to your wild garden. I would add some lavender bushes here and there along with some Rosemary picking up the colour of the wall. Happy Valentines Day to you and yours. Thank you, Dore. I love your suggestions of lavender and rosemary. Rosemary does very well here. I had it at my last home, so I will pick some up. Lavender colored bushes can do well, and I'm trying three new kinds, new to me. I have to look up the names. Salvia leucantha (one of my favorites) and real lavender struggle here. I plant lavender in the beds, because the bees love it! It's their favorite. I know lavender is suppose to be perennial, but they last a season here due to the summer temp. This time we paid someone to do the walls. My husband has done most things here, but not this; it's too large. It will take some 24 tons of crushed granite just for ground cover, so we saved for landscape. He did the front and he layed 14 tons of rock. Lawns don't grow here, because we are on a downslope close to the preserve and it's caliche; we tried a small spot and it didn't take. We have giant grass plants in the front, that don't seed, and they do well in the desert. Have a wonderful weekend and thank you for the great advice on French desert garden. So this is the wall you told me about. The colour is perfect to enhance plants in front of it. I can see it reflects the color of the yellow flowers! So interesting!! Enjoy gardening! I love your walled garden. Your lovely wall must bring you such joy! The wall is a good backdrop for your plants. I see the beautiful shrub with the yellow flowers is cassia and not mimosa as I thought. We have concrete retaining walls in Italy. Although they're grey in colour and some have ivy growing on them they all need a fresh coat of paint! I don't mean to be mean....but you are teasing me so seeing something actually in bloom. Oh my I can't wait, well at least two more months here. The wall makes a great backdrop for many plants. The wall looks really nice! Thank you, Rue. It's nice that they all match now. Your lovely garden is a sight for sore eyes, Su! It's -20 here and I'd love to sit and warm up in your sunny garden. The stucco walls are gorgeous! Wow, it is lovely. It's so nice to see some garden goodness, since it is 2 degrees in my part of the world.